People from remote Fijian islands seeking work in Suva, have ended up living in ‘informal’ settlements, in cobbled together housing and no municipal infrastructure. 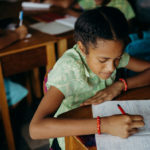 While education is free in Fiji, ‘squatter’ children still miss out because basic school supplies are unaffordable. We support the families in one such community by providing school uniform, school badge, a school bag and a pair of school shoes. Education breaks the poverty cycle, and some of these children have made it to university. A new phase of this project is likely to include education opportunities for women as well. Over the last 5 years we have supported 500 children to go to school, and two to attend university. Uploaded on Vimeo in Dec 2017. Download this video or Click here for more videos. Uploaded on Vimeo in Nov 2015. Download this video or Click here for more videos.